The Lao Kip is the current currency of Laos. Currently, its code is LAK, and the currency sign is ₭ or ₭N (encoded). Between the years 1945-1946, the Free Kip Government in Vientiane printed a series of paper money in 10, 20, 50 Att denominations. Even 10 kip was issued then, before the French took control and created the French Indochinese Piastre as the currency of Laos. The Royal Kips were introduced in the year 1952. Coins were also circulated. The Institut d’Emission des Etats du Cambodge, du Laos et du Vietnam, Laos Branch issued notes in two currencies, the kip and piastre, in 1953. They were both made at 1, 5 and 100 denominations. 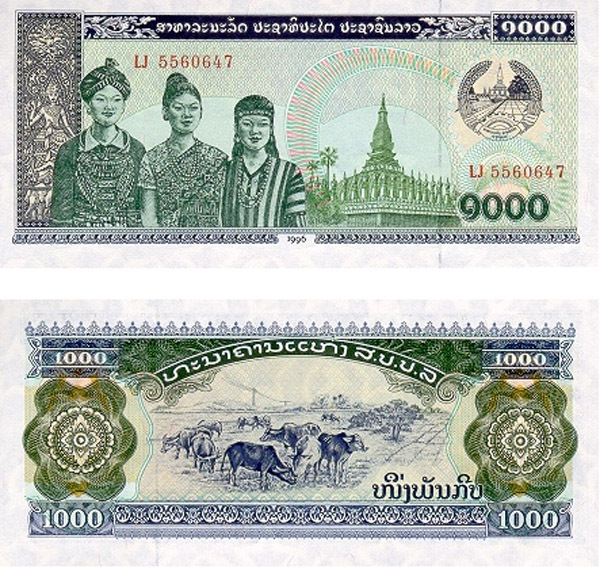 Four years later, the Laos government printed solely kip notes – the notes were of 1, 5, 10, 20, 50, 100 and 500 denominations. In 1963, 200 and 1000 kip notes were joined and 5000 kip notes were added later in the year 1975. During this time, the banknotes were printed in France. A year later, another kip was introduced, called the Pathet Lao Kip. Banknotes with the denominations of 1, 10, 20, 50, 100, 200 and 500 kip were circulated. This time, the notes were printed in China. Pathet Lao kips replaced the Royal kips throughout the country when Pathet Lao’s took over Laos. The exchange rate for the kip was 1 Pathet Lao kip = 20 royal kip. 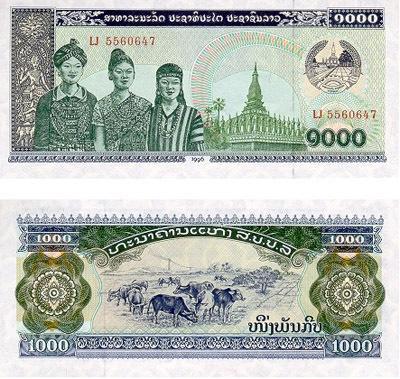 In 1979, Pathet Lao kips were replaced with Lao PDR (People’s Democratic Republic) kip due to currency reformation. Banknotes were dispatched in denominations of 1, 5, 10, 20, 50 and 100 kip. Added in 1988 were 500 kip banknotes; then by 1000 kip in the year 1992; 2000 and 5000 kip in 1997; 10,000 and 20,000 kip in 2002; and 50,000 kip last January 2006. Coins were once again circulated in the year 1980’s at denominations of 10, 20 and 50 Att. When the country celebrated its 10th Lao People’s Democratic Republic, 1, 5, 10, 20 and 50 kips were issued. Currently, due to heavy inflation, no coins were dispatched around Laos. Last November 2010, the government issued a 100,000 kip, commemorating the 450th anniversary of the founding of Vientiane and the 35th celebration of Lao People’s Democratic Republic. As of February 23, 2011, 1 Lao Kip = 0.00012 U.S. Dollar. When a dollar is to be converted in Lao kip the value is 8056.0000 Lao Kip.